Both gold and silver prices have been undermined recently by the ongoing rally in the stock markets, with investors preferring the racier equities over the perceived-haven metals. However, with the US dollar struggling for direction and global central banks all turning dovish recently, I continue to believe that the downside is limited for precious metals and a surprise recovery could be on the cards soon. As such, I am keeping a close eye on both metals for possible bullish reversal signals. Today, we may have seen a possible low form in silver, although further price action is needed to confirm this potential reversal signal. The price of silver fell earlier to its lowest level in 2019, reaching $14.85, before turning around to turn green on the day. Gold has likewise recovered from its session lows to trade near the day’s highs at the time of writing. 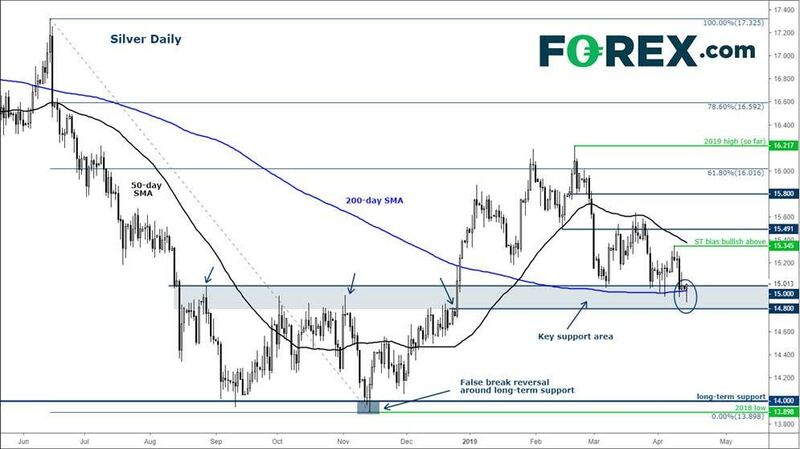 Silver found support from the $14.80-$15.00 long-term pivotal area, which we have previously highlighted as being a technically important region. Silver bulls will need to push the price of the metal above its most recent high of $15.35, hit just last week, in order to regain further control. If that were to happen, I would turn decidedly bullish on the metal for then we will have our first higher high. However, if silver fails to achieve that and eventually drops below the aforementioned support area beneath $14.80, then in that case I would drop my bullish view on the metal.